I found this lamp at the Salvation Army before I even met my husband. I fell in love with the textured plaster and the hourglass shape, which nestled just right into my arms as I browsed. I probably would have bought it even if it hadn't worked. I loved it that much. As part of my I'm-getting-my-very-first-apartment repainting spree I took this little duckling from a criminal beige with gold accent to an olive green with silver accents. And then I searched high and low for a lampshade. It was epic. We've been inseparable ever since. 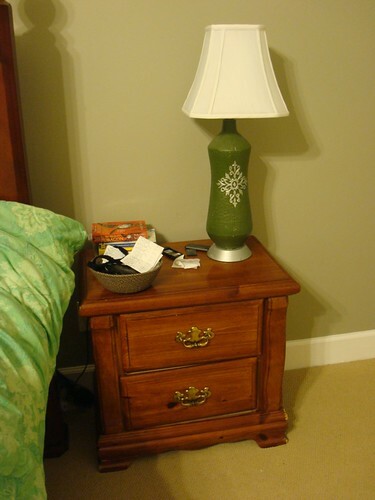 Luckily, the hubby knows an AWESOME lamp when he sees one and it's been a happy bedside lamp in several abodes. (I think. I mean this one at least makes two. I'm fuzzy on the others right now). Anyway, point being it is finally set up again! And we've color checked it against the bedding and the new teal pillows (which are nearly, nearly done) and it passed. Hooray! That is a cool lamp!